The Spoliarium is an important part of the history of The Colosseum in Rome, Italy. This is the part of the Colosseum Complex where dead gladiators were brought after the fight in the arena. It is known that gladiators were trained by different ludus during the early rule of the Roman empire. 1. The Spoliarium is connected to a gate in the Colosseum. This gate was called the “Gate of Death”. It was in this gate that dead gladiators were dragged to be brought to the Spoliarium. 2. Once the deceased gladiators are brought in the Spoliarium they are stripped off their armors and weapons. This is done before the bodies of the deceased are disposed of. 3. It is still uncertain what really happens in this chamber. The reason behind this is that no Roman writer was able to write about what truly happened in this death chamber. Speculation abounds in history that after the dead gladiators were stripped of their armor and weapons, these items were brought back to their lanista. 4. Students of medicine, specifically anatomy, are said to purchase some of the dead bodies as a way of furthering their studies. 5. Dead animals were also disposed of in the Spoliarium. This fact led people to believe that this part of the Colosseum had a stench of death and that there must be a lot of bodies piled up after each game in the arena. 6. 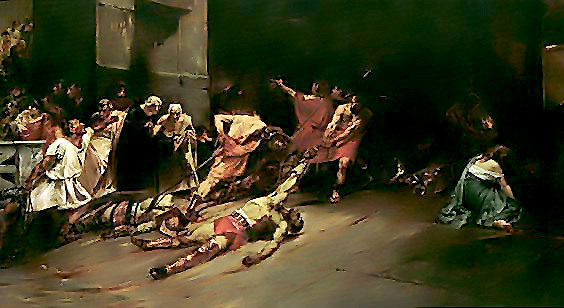 A painting made by Juan Luna of the Spoliarium, depicts the horror that may have been going on in the Spoliarium. It shows a gladiator without life being dragged into the darkness of the chamber. These are some of the facts that have been accumulated over time about this part of the Colosseum. Until this very day, the Spoliarium still brings a sense of death whenever it is mentioned or imagined. No one can truly know what happened in this chamber but it is considered a very important part of the Roman history.